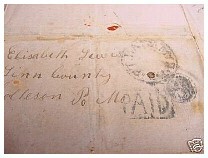 These letters and deed were offered on eBay by Intrinsic Collectibles recently. 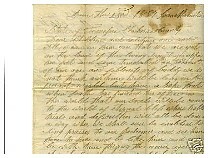 They consist of correspondence between several Claiborne County family members who left Tennessee and Linn County, Missouri around 1849 for California. The families were sons of Fielding Lewis of Sandlick, Tennessee and realitives Moore, Bullard and probably others not known to me. You may recognize many of the family from descendents. I have included a webpage with a short lineage record HERE. 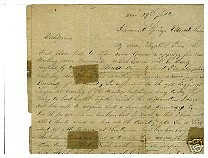 I think you will agree that GOLD and the thoughts of it were a strong force in early America. 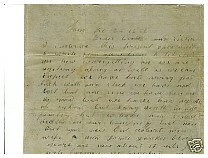 November 29, 1850 Letter, Gold Rush Era Correspondence from Charles Lewis at Diamond Springs in Eldorado County, California to his wife Elizabeth Lewis in Linn County, Missouri. 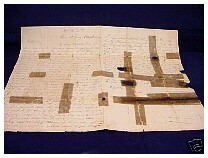 Charles and his son Lee left Missouri in June 1850 to go to California in search of gold. 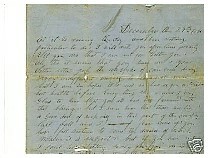 November 29, 1850 Letter, Gold Rush Era Correspondence from Charles Lewis at Diamond Springs in Eldorado County, California to his wife Elizabeth Lewis in Linn County, Missouri.